…and, btw, Designer Laura Kirar to present in High Point, at the High Point Design Center’s Unity in Design Event…details below. In the May 2010 edition of Elle Decor you will find Elle Decor’s Guide to the “Top 10 Cocktail Tables” , page 106, with designers Laura Kirar of Tru Design, and Ernest de la Torre, of De La Torre Design Studio, commenting on the magazines selection. Not sure how many people realize that although long low tables have been found in Asian homes literally for centuries, that it wasn’t until the early 20th Century that such became a living room essential in the West. That room where casual seating/entertaining became more formalized and a place for drinks, flowers, books and even casual dining required, what has now become the cocktail table. I love the fact that the origin for our staple hails from the Far East, with this particular design, of the scroll table, being mimicked, as depicted above, (doesn’t Laura grace that table beautifully?) with the very modern white lacquer piece, as available at Shine by S.H.O. Commonly known as a “musician’s table” these tables, which hail from the Shan Dong province implement the characteristic Chinese dovetail joinery to create the smooth “bend” in the wood. Typically found in black or red lacquer, or a honey tone. “I entirely LOVE the red scroll table! It is an incredibly perfect fit, in the spot in my reading room–just as I suspected it would be! (…amazingly modern feeling, but in a classic way) It has sort of a quiet, artsy edge to it, that feels wonderfully “meditative” in my space! 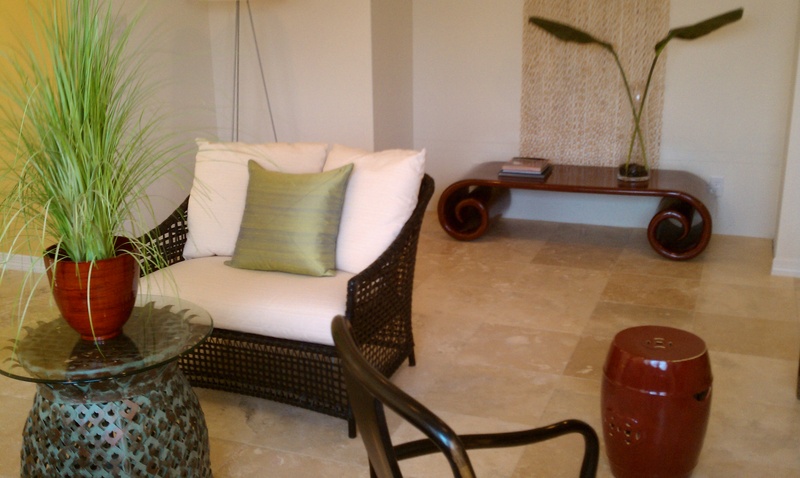 Click here to view other aspects of Shaunda’s personal retreat in her home. 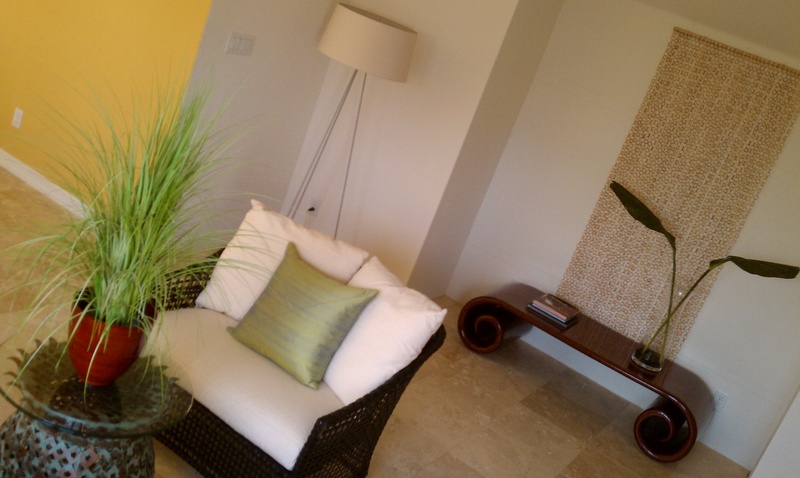 We should ALL have such a place in our homes… Thanks for sharing Shaunda! 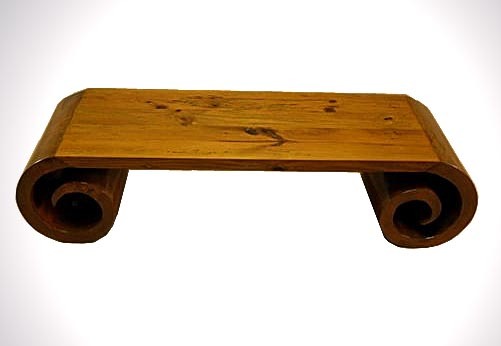 Should you be interested in locating such a piece for your home, please check out our coffee table section on our site. On another note, should you want some good feng shui advise, be sure to follow my dear friend Katy Allgeyer’s blog called Feng Shui by Fish Girl. You also want to check out Katy’s website…aside from being an expert in Feng Shui she is also a very talented artist. High Point Design Center is planning thier next Unity in Design Event…and guess who is one of the designers slated for the Keynote Panel? 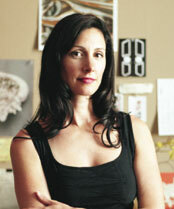 None other than Laura Kirar, the designer who contributed to this Elle Decor article I just referred to above. If interested in meeting Laura, I know I am, and hearing her speak, please join us in February in High Point NC. Online registration is available by clicking here. I personally look forward to participating in this event as a member of the High Point Design Center. This will be my 3rd year wending my way to NC in Feb for UNITY, and simply an event I look forward to every year…benefitting my self and my business. P.S. Welcome all designer bloggers to spread the word! Thanks so much for the comments. I do very much enjoy what I am doing through my business and glad that that sentiment comes through. Can’t wait to incorporate photos of your abyzaar coffee table into an upcoming post. Ruth, I just love your colorful posts. They incorporates my favorite designers,shows scrumptious photos and readily portray how your beautiful antiques can be incorporated timelessly into our homes. Looks like you have a lot of fun doing what you love.